Conferences are an ideal way to bring together the energy and ingenuity of women entrepreneurs. As the presenting sponsor of “EXCELerate 2015: Growing Your Business with the Speed of Collaboration”, and a Founding and Leading Partner in Development of GroYourBiz as well as a Corporate Sponsor of WBE Canada, BMO Financial Group supports the success of women business owners by helping them access new markets, learn new ideas, and be inspired by others. On behalf of the Sponsorship Committee for the event, I am pleased to offer you an opportunity to join us in supporting this “first” multi-country businesswomen’s collaborative conference focusing on increasing trade locally, nationally and internationally. Women Entrepreneurs are changing the business paradigm globally at an accelerating pace. Forward thinking world industry leaders are revamping their marketing efforts to reflect the growing economic power of women. Large and small businesses are including diversity as a key component to their success. Women-owned businesses is growing 60 percent faster than the number of companies run by men. Recognizing the power of women-owned businesses will help companies and communities become more prosperous and sustainable. The “EXCELerate 2015” event will be high profile and powerful. Your sponsorship will demonstrate your support of this increasingly important market and introduce you to many growth-oriented companies led by women. I look forward to welcoming you to the participating sponsor list! EXCELerate 2015: “Growing Your Business with the Speed of Collaboration”— is pleased to provide your company or organization with positive profile through your sponsorship involvement. The benefits that make up your sponsorship are guaranteed to raise your profile with this important target market of International Women Entrepreneurs. Over 350 delegates are expected, with approximately 55% being Canadian entrepreneurs. The reach of the program will touch over 10,000 women entrepreneurs in Canada, plus reach an influential business audience of 500 guests at the gala event. We invite you to contact us to discuss all the possibilities of Sponsorship for your organization. We look forward to tailoring a sponsorship package to highlight your company, product or service. 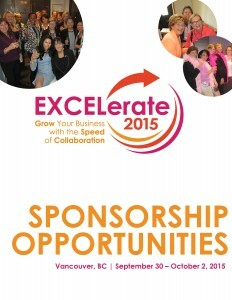 Here are our G7 Summary of Sponsorship Opportunities for EXCELerate 2015! In keeping with the goals of EXCELerate 2015 and our collaborative model, which is to foster the economic empowerment of women, all profit generated from this gala dinner will be donated to The Malala Fund which aims to create a world where girls are empowered to reach their potential through a quality education.